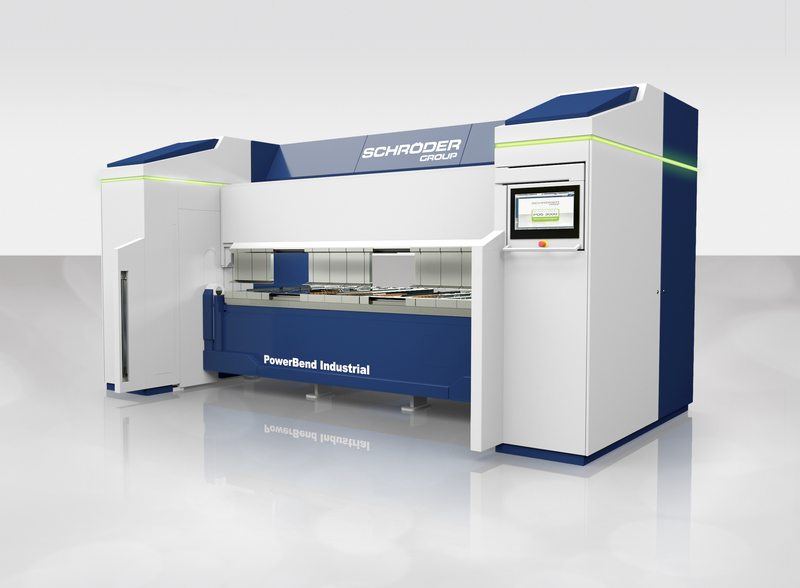 Wessobrunn-Forst (Germany), 17 January 2018 – Schröder Group will be exhibiting its folding machine together with its Italian sales partner at the trade fair SamuExpo. This important sheet metal working exhibition takes place from 1st to 3rd February 2018 in Pordenone. The main focus on the Schröder-booth 10-C in hall 4 will be the motorized folding machine PowerBend Industrial. The PowerBend Industrial is a heavily motorized and robust folding machine for up to 6 mm thick steel sheets. This machine type has not only been designed for continuous use in serial production but also for processing small series and single pieces. Various advantages such as the hydraulic tool clamping at both the clamping and the folding beam allow a comfortable handling for the operator. With high quality tools, an extremely torsion-resistant machine frame and the intelligent software control POS 3000 this machine is perfectly suited for precise steel sheet processing. This includes a surface-gentle sheet metal processing: Thanks to the combination of a suction gauge and an Up-and-Down folding beam the sheet has to be gauged only once for all folds and counter folds and does not need to be turned over. The broad range of potential applications will be showcased to SamuExpo exhibitors in two particular features of the PowerBend Industrial: In order to bend slim profiles the folding machine can be operated from the front on request. With its radius-step-bending function the PowerBend Industrial is able to achieve high-quality roundings: therefore the clamping beam pushes the sheet in fine steps against the bottom- and the folding beam.